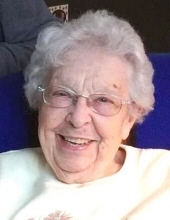 Ruth Ellen Farrar, 93, passed away peacefully on March 19, 2019. We rejoice because she has gone to heaven and is celebrating with her family. We are sad because we will always miss her and the love she shared with all her family. Ruth was born on June 26, 1925, at Lewistown, MT to Henry and Bertha (Merrill) Wicke. She attended school in Lewistown. On September 19, 1943, she was united in marriage to Victor C. Farrar. Ruth was employed with Dr. McKenzie as a Dental Assistant in the 1960's. Later, she worked in many offices at the Fergus County Court House. Ruth enjoyed spending time with family. She was a music lover since childhood and has always sung in church choirs. Later in life one of her biggest joys was the Kitchen Band, in which she played the Kazoo disguised as a kitchen wisk. They had so much fun and felt they brought joy to those in the audience. Ruth also kept busy playing cards, dominoes and visiting with friends. She spent hours working on Genealogy. Ruth was a part of many organizations: Milwaukee women's club, DAR, GAR and VFW auxiliary, just to name a few. Ruth is survived by son, Mike (Velma) of Washington; daughter, Shirley (Joe Sr.) Ward of Lewistown; 6 grandchildren: Chris (Greg) McGuire of Washington, Joe (Wendy) Ward, Jr. of Lewistown, Janice (Rob) Kolar of Lewistown, Lee Farrar of Florida, Debbie Farrar of Billings, and Brad Farrar of Lewistown. In addition, she is survived by 14 Great-Grandchildren and 7 Great-Great-Grandchildren. She was preceded in death by her parents, Henry and Bertha Wicke; husband, Vic Farrar; son, Gene Farrar; sister, Helen Kern; and brother, Henry Wicke. Memorial Services for Ruth Farrar will be held at Creel Funeral Home on Monday, March 25, 2019 at 10:00 a.m. with inurnment to follow at Central Montana Memorial Gardens. Memorial donations are suggested to the Council on Aging or to Central Montana Hospice. To send flowers or a remembrance gift to the family of Ruth E. Farrar, please visit our Tribute Store. "Email Address" would like to share the life celebration of Ruth E. Farrar. Click on the "link" to go to share a favorite memory or leave a condolence message for the family.